Dylan Crossman Dans(c)e. Photo by Julie Lemberger. 92nd Street Y, New York, NY. Life in 2019 seems full of shifts, changes, and stirrings — in our minds, in how we travel, in where we work, in where we live. Sociopolitically, around the world, many have a feeling that things are simply unanchored and uprooted. Dylan Crossman Dan(s)ce’s Jamais Plus (roughly translated from French as “nevermore”) called upon displacement and disruption of bodies, objects, and the intangible in space to illustrate this sense of rootlessness. At the same time, a grounding was there in “humanity, with all of its beauty and darkness” – in “love, doubt, fear and acknowledgement [of our] differences” and a “push[ing] back against the daily acts of violence” amidst “political unrest”, as the program described. Beginning to build this sense, some audience members might have felt a bit unsettled to see dancers already performing onstage as they arrived (“are we late?”, “can we talk still?”, some might have asked themselves). Yet the soft, sinewy yet so very clear and intentional movement made me, at least, feel quite content. Precise geometry within familiar shapes had unconventional touches, such as hips lifted from grounded shoulders and feet (“Bridge Pose” in yoga) and one arm lengthening to the side (away from the body). Dancers flipped from this into a plank with one knee bent and that foot pointing up to the sky. All in all, the movement was a collection of angles and curves. Little did we in the audience know that we’d see it again. Underlying this movement all the while was a musical score reminiscing a storm building off in the distance (sound design by Jesse Stiles). We also got a little window into the dancers’ world; every so often one would say “hold!”, and that’s what they did, pausing where they were and then starting again in a few breaths when one said “go”. Soon enough a violinist (Pauline Kim Harris) began to play offstage, and lights onstage came up as house lights came down. Okay, this had to really be the performance’s beginning, I thought. The three dancers who had been dancing continued doing so, as a fourth dancer entered. 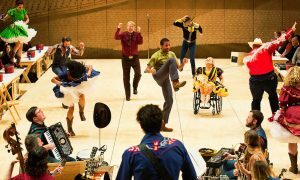 They moved slowly, still on the ground, as the fourth dancer danced up high and in various tempos. There was a clear contrast here, between what created something meditative and what created something more tense. This contrast was one tool, amongst several others that Crossman used, in service of meaning and mood throughout the work. Also throughout, movement had a pleasing understatement; evidently enough, the goal was not height in leaps and extensions or number of revolutions in turns, but rather control and a commitment. This also served meaning and mood. Contributing to both was the way the violinist came in and out. At one point, lights came up on her playing off on the side, and gradually also came up centerstage to reveal a dancing soloist (lighting design by Davidson Scandrett). This development aligned with frequent shifts and changes in the work, and a sense of the unexpected transpiring. This dancer soon joined other dancers onstage in a vertical line, and all danced a slow phrase of sweeping and searching. The drama was building. 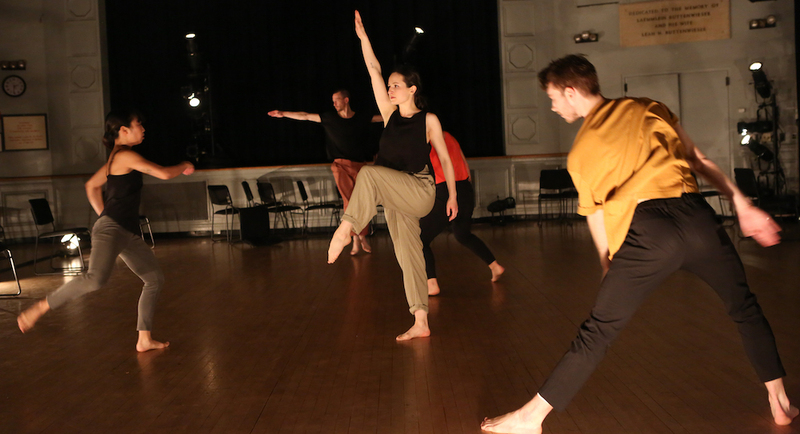 Simplicity remained in the movement, even as more virtuosic movement emerged. It all felt successful, though as this section progressed the spacing and unison timing could have been clearer. This quality likely only felt evident because these elements were so clear most everywhere else in the work. A few dancers exited to leave three dancers on stage, who created another two-versus-one contrasting dynamic; one moved slowly while the other two moved quickly. 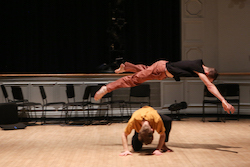 Crossman showed his penchant for working with numbers of dancers in these sorts of compelling ways throughout the work. The feeling of angularity in the movement intensified, though there was still a softness — such as in an initiating from supple elbows. Also continuing and intensifying was that sense of displacement, of being uprooted; settling would occur, but only momentarily until a new formation would take shape. Further contributing to this feeling, in a later solo a spotlight was center stage, yet the soloist danced outside of it. From this choice was a sense of being in the wrong space, yet unable to move to the right one. Also bringing this “something not quite right” sense was a group section in almost total darkness, a bit later in the work. The movement was strikingly beautiful, and skillfully delivered, yet the effect of dim lighting felt a little overdone; practically speaking, it was rather hard to see. Another memorable section soon after this was one dancer accumulating chairs, pushing an ever-growing stack with his head; one by one, he added chairs, creeping along towards stage right as the stack grew larger. The simple black-backed stacking chairs had been set up in rows, placed there one by one by a dancer. 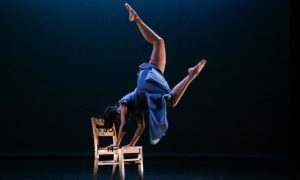 After a compelling section movement with unison and individual timing, the movement with a circularity and slow build like a growing cyclone, came the moving of those chairs by the head. Something formalized, neat, and ordered wouldn’t remain like that for long, however. Movement motifs were also grounding — such as a turn in the air with legs tightly squeezed together (tour en l’air) and arms spread wide, like a flying helicopter, seen at different points in the choreography. These resurfacing movements delivered an element of sameness amidst so much change. Movement coming back from the opening section was also interesting, and strangely comforting, to see – “I remember that!” I thought to myself, feeling myself slightly smile. What was less than comforting was the ending, a duet with two danseurs that felt like capoeira with intentional contact added (at points, actual wrestling). They separated, looked at each other — one standing, the other on the ground — and the lights faded. This conclusion left me puzzled; lacking resolution, but having a momentary reprieve from the fighting, was it implying a continuous cycle of violence and tense rest? It also seemed to lack the carefully crafted drama seen elsewhere in the piece. As a viewer, I wanted it longer and more layered, to be more thorough and clear. 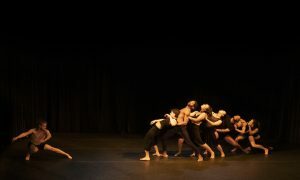 All in all, however, Dylan Crossman Dan(s)ce’s Jamais Plus was a cogent dance art exploration of disruption, displacement, and a rooting in our humanity. In a modern world that tries to unanchor us and test our humanity by the day, I’m grateful to see this commentary play out onstage.